5 stars from me! a must see…. touched me in too many ways to count. Ah….the road(s) not traveled…….. Om shanti. Well, I am simply filled to the brim with joy and gratitude for last weekend’s Harper’s Escape. It was fabulous and I promise to gift myself more harp events. Meanwhile, last week I also learned how to lightly edit an audio file and upload it to the internet. I know it’s no big deal anymore to do that, but for me this feels really cool! Uh oh…..I do see YouTube in my future! Uranus is flooding my chart right now with ‘breakthrough energy’ so this seems like a good way to use it. Wow! Sunday was my first-ever storytelling performance with a harp, and the audience was delighted. I recognized some serious applause and I was told later that everyone was talking about me, although, I don’t think it was really me they were talking about….it was really about the harp. Once again I forgot how utterly mesmerizing this instrument is to most people….and me too, of course. For all the worry, anxiety, and practice….the music just flowed exactly the way it was supposed to. 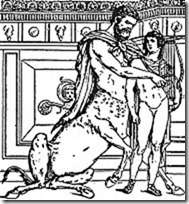 In the first person, I told the story of Chiron’s Birth and why he came to be living in a cave with his harp. 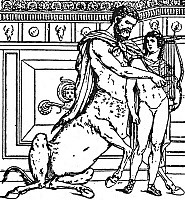 This centaur, known as The Wounded Healer, is a mythological story that has captured my attention for the past 20 years or so and I’m frequently referring to his symbolism in my lectures/workshops and yoga therapy classes. He’s got a powerful story for our times, for sure. So many of us feel wounded, shamed, abandoned and just plain old sad. I’ve blogged a bit about Chiron, the asteroid, and this post gives a pretty good overview of the astrological Chiron. Today Chiron is traveling thru Pisces which supports healing thru music. This was the first time, in a long time, that rather than teach or facilitate, I practiced Performance & (intentional) Drama. I was totally unprepared for the sheer joy that I experienced after it was over and thruout the following day. It was wonderful to find a new, creative outlet that brings together so much of what I love to do, and still challenges me in new ways. But four minutes is nothing when your hands are on the strings, you know? Already, I am planning Chapter 2, and expanding my story to maybe 10-15 minutes? Who knows? For now, Storytelling is a new hobby/activity for me and I am so excited to see where it takes me. I am in need of music that would flow, over my fretful, feeling finger-tips, over my bitter-tainted, trembling lips, with melody, deep, clear, and liquid-slow. Oh, for the healing swaying, old and low, of some song sung to rest the tired dead, A song to fall like water on my head. And over quivering limbs, dream flushed to glow! There is a magic made by melody: A spell of rest, and quiet breath, and cool heart, that sinks through fading colors deep to the subaqueous stillness of the sea, and floats forever in a moon-green pool, held in the arms of rhythm and of sleep. a sound is good or bad. Please watch your ‘judging’ mind. That is part of the practice. Begin by just noticing sound. In your home. In the environment. In your body. Notice the breath at the same time, because there can be no sound without chi. To learn feng shui, you must understand chi. To understand something like chi, you must experience it’s effects. Feng Shui has a strong experiential quality……it cannot be learned by the mind, alone. Sound is a very important element to consider when feng shui’ing your home. to listen more closely to the sounds in your home. Watch this video for inspiration…..if you like it check out the movie: Touch the Sound. I watched it last night. Do you have any instruments in your home? Where have you placed them? Think about it. Meditate….. contemplate silence. Why do you play the harp? I returned home from the 2009 Harper’s Escape on Sunday. The tunes are still running thru my head, awake and asleep. I am filled with joy and gladness that so much joy and gladness can be shared with harps. Yes? 40 of us gathered strong under gloomy, doomy October skies to learn a few tunes, in community with each other. Angels as well as devils showed up. Spiritual energy/vibration allowed it to be all okay, just as it is. Om shanti. Peace to all. On Sunday, we performed as a sort of harp orchestra at the local public library. We were quite the hit; a waiting line stood patiently outside the room for the entire performance hoping for a seat to open up. I was relatively pleased and content with my own ‘performance’, noticing with every breath how the inner critic is still alive and well! But, once again I was amazed and awed by the sheer diversity of our group. The harp is what brought us together and held us in-common. Regardless of color, creed, culture, or zodiac sign, we worked together for an entire weekend to create a concert for the public. Peace is always possible. Astrologically speaking it was a weekend of Neptune/Chiron/Jupiter & Moon energies. Sweet, serious, and silly all together with lots of food, drink, and water…….it rained a lot. The balsamic phase of the moon was occuring in Late degrees of Libra. Read more about balsamic, it’s very important to understand our human need for deep rest. Gotta go practice……I’m haunted by the Harris Dance. I checked in with the Acoustic Musician’s Guild last night. It was a wonderful jam of many guitars, one flute, a drum & some jingles. Mostly we played country/folk……one of my most favorite genre’s. However, there were some Beatles tunes, original songs, and of course a couple of Celtic tunes to liven up the evening. Time to leave the world of words for a while and immerse myself into the vibration of harp strings. I’m getting together with some other harpers today. We’re practicing so that we can be ready if a ‘gig’ comes up. It doesn’t matter to me. I enjoy making music together with other musicians. It’s as simple as that. I’ve always thought of the harp as a solo instrument…..until I saw one of those huge, golden, shimmering pedal harps in the corner of an orchestra. That wasn’t me. Anyway, I’m taking my harp on the road these days looking for where the musical thread of my life may take me.